I’ve been following the Aaron Hernandez alleged murder case pretty closely and since I’m living in the Boston area I imagine I’ll be hearing and talking quite a bit about it throughout the next year as the criminal trial date could be set in 2014. Being an NFL fan, and with ESPN working the way it does, and CNN, FOX and other major networks covering the story and by simply being shocked by the craziness of this situation, well I admit, I’m captivated. Even though I wish I was reluctantly captivated, I must admit this week I am. Here we have an extremely talented 23 year old football player who last summer signed a $40 million extension (with another $12.5million in signing bonus) who plays for one of the best NFL Teams/organizations in all of sports, who had a legitimate chance to play in another Super Bowl and enjoy a Pro-Bowl career who was instantly fired by the Patriots an hour of his arrest. Further, the lives of his fiancé, 8 month old daughter and the family and friends who loved him have radically been changed. I heard someone on the radio say, “All he had to do to insure his family’s prosperity for his children and grandchildren was not kill someone.” Wow. It’s at this point, we typically say, “This is a tragedy.” But it isn’t. The Aaron Hernandez story is not a tragedy. Now, the story of the victim, Odin Lloyd, is tragic. The story of Aaron Hernandez is a cautionary tale. And we’ve heard this one a number of times, a talented athlete/celebrity/influencer who uses his/her wealth/fame/power to steal/cheat/ or get away with something. Perhaps this individual is delusional, perhaps desperate but regardless of motivation, this person gets caught and squanders all the status and benefits of being him/her. Typically the general public turns on this person and hold him/her up as a cautionary tale for all to see. It’s the closest thing modern society has to a public crucifixion. My first thought was to reply sarcastically, but my friend is an intelligent fella so I took a moment to consider his question. I like being pushed a little so it looks like I have a follow up post inniated by a reader – I’ll take it and know that I appreciate you engaging with me. We say all sorts of things here, “We’re just hoping to get some rest but we are traveling a little. Later we are flying down to Florida” or “Headed up to Maine” or “We’re taking it easy this summer but we are remodeling the kitchen and my extended family is coming in July, then we are …” Slowly we realize, we’re not really going to find much rest and relaxation in these coming months. As Susan and I survey our summer calendar, prepare for our vacation and day trips, talk about home projects and try to keep up with our 3 little ones, we already know there will not be much “rest” to be had here. And while running yourself ragged is certainly no virtue, I’m not sure rest is what we really want. I’ve been blogging about the Collyde Summit – for the context, check out Post 1 and Post 2 but at the moment, I’ve been thinking about the workshops. Yesterday I wrote about Mako Fujimora, today is on Joan Ball. I first ran into Joan at the Collyde gathering in 2010 (the one affectionally known as the “Beta-Collyde”). She’s among the most interesting people you’ll meet at these types of things – generous, conversational, and energetic – it was a good thing One Village was there giving out coffee, otherwise I might not have been able to keep up with her. Joan began her workshop by summarizing her coming to faith story as it was just 10 years ago she became a Christian. You can read her story in her book, Flirting with Faith. I like the way she shares her story – she had a lot of ups and downs – the same as everyone else. And while it’s wonderful how many people find Jesus during a difficult crisis in the valley, Joan actually goes through a different experience. As she mentioned, she was living a normal life, even a successful one by some standards, but after becoming a Christian, her life goes through a downturn. Her family is met with financial hurdles, job loss, long periods of life-frustration and significant changes in their family dynamics. I wish she could have shared more here but at least we knew there was no prosperity gospel coming. Last week I attended the Collyde Summit and agreed to blog about it. You can read the previous post on what I thought of their Concept here and soon I’ll post on the events that happened on Day 2 and the Main Presenters. Also check out fellow conference blogger Evan Curry or his quick summary. I like conference workshops and while Collyde didn’t use the words “pre-conference,” it’s what I heard. In fact, the pre-conferece was one of the highlights of the Justice Conference for me. They tend to give those who are already in the conversation a deeper take on the content that is being presented (so when I saw Makoto Fujimora and Joan Ball scheduled for the morning, I was excited). I attended the Collyde Summit over the weekend and agreed to blog about it. On at least three occasions at the Summit and a couple prior, I was encouraged to be as honest as possible. I have not been paid in any way and aside from a waived registration fee, I have not received any type of compensation. In fact, the driving and weekend away from my family comes at a cost to me which begs the question – Why would I bother going to the Collyde Summit in the first place? From my first encounter with Collyde, I knew it would continue to draw amazing people in the Tri-State area of NJ, NY & PA. It’s a tough part of the country to not only find fellow Christians but ones that are dreaming of bringing Jesus’ kingdom on earth as it is in heaven. I like Collyde Summit and the people who are running it. I have met the founder Jinu Thomas three times now and have had a couple conversations with the very dedicated and highly motivated Collyde team. I have to say, I’m rooting for them. 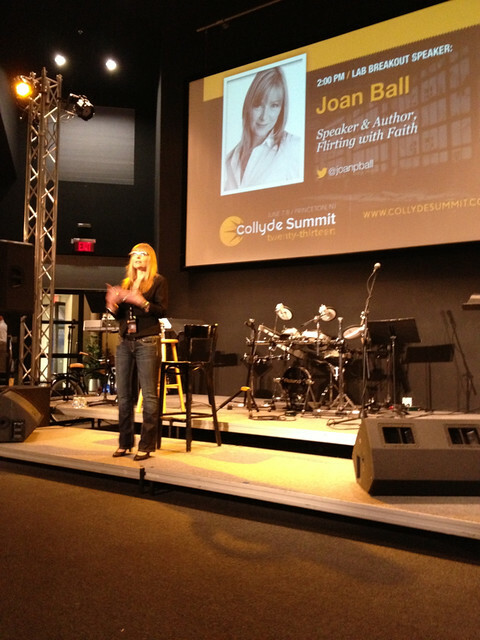 Today and tomorrow I’ll be at the Collyde Summit in Princeton, New Jersey. I was honored to be asked to blog/tweet some thoughts on the event and I am hoping there might be some helpful takeaways for you ministry types. For me, I like the people organizing the event (like Jinu Thomas). I think their hearts are in the right place and really felt compelled to come down from Boston. A few years, I was able to attend the first Collyde Summit (they would tell you last year was the real first, I attended the beta ;). Whatever it was I liked it and here my links are included below. This year’s theme is “Only Believe” and you can read more about that here.